On the day when a report from the International Panel on Climate Change (IPCC) has prompted headline writers to debate Adaptation versus Mitigation we highlight an altogether different approach – one that demands that we rethink the way economies work. 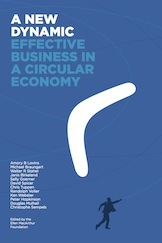 In ‘A few words about a Circular Economy‘ we consider the challenges of communicating fresh ideas in an environment where words like ‘green’ are no longer helpful. New digitally-enabled capabilities are hastening the end of mechanistic ‘linear’ economics but expertise in understanding Whole Systems’ and ‘Ordered Complexity’ is only just emerging. Our editorial gives just a glimpse of the potential for fresh thinking being pioneered by the Ellen MacArthur Foundation and comments on how we must also rethink our choice of words to describe the journey. The footnotes include a link to ‘Booms and Boomerangs’ – our January review of ‘A New Dynamic’ (the set text for MBA students at the Bradford University School of Management) and other material from the Ellen MacArthur Foundation. ← Cutting Red Tape – lengthways?